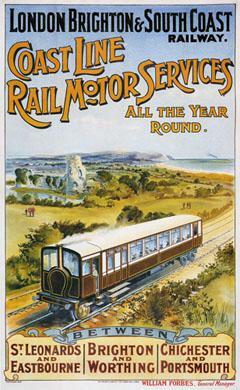 Edwardian (1906) poster advertising the London Brighton & South Coast Railway's Coast Line Rail Motor services. In an attempt to introduce cost-effective stock to loss-making passenger services the LBSCR acquired two steam- and two petrol-driven rail motors. They were not a success.